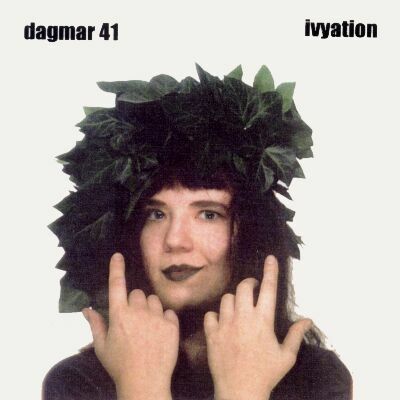 Especially , "ivyation" tends to be both the job description and second album by German artgirl Dagmar 41. Navigating the uncharted border territories between pop, folk and downright avant-garde, "ivyation" exudes a rough-hewn charm that is no less than captivating. Inspirations and atmospheres range from the upbeat tongue-in-cheek anthem Life Without Men & Axioms (dedicated to a friend who had started her math degree with said proposition and ended up a happily engaged nuclear chemist) to the pensive, Borges-inspired Ten Nine Eight with its Arabic soundscape, from the bittersweet string quartet setting of Fivewater (one of a series of songs about neurotic Belgians) to the heavy-but-surreal rock of The Admiral Is Seeing Archangels (which features an ace admiral impersonation from Stuart Gordon, veteran fiddler of Korgis, Heinz Rudolf Kunze and Peter Hammill Quartet fame). All other instruments, and that includes such oddities as Czechoslovakian Airlines spoons, the Rhine, a taped letter, the door of the Dept of Chemistry at Mainz University and Stingbert The Scorpion, are played by Dagmar 41 herself. Lay Lady Laughter: the sound of silliness. I once won a poetry slam with a verbal meditation based on the looped and loopy initial babble...! The Admiral Is Seeing Archangels: on account of the guy being Swedish (and mad! ), Stuart Gordon appeared to be the perfect man to play the part. It took some convincing to make him do the "Admiral-in-the-bath" bit (among other things from Peter Hammill who pointed out that Stuart's Geordie accent is the closest an Englishman can get to a Swedish accent!). The distorted voice at the beginning reminded someone of Hammill's "Magog" - well, it's the same man speaking, namely Judge Smith... the spoken bits are excerpts form a taped letter he sent me years ago, and the "anyway" is right in place where it is - no editing required! Ivyation: entirely improvised, layer after layer. The loop at the end is taken from one of my friend Rob's songs, taped, manhandled, threaded back into the cassette and played backwards. As with the last album, this one wasn't actually meant to have a title track until the very last minute. Blame Hedera Communis (yes she has a surname), the upstart ivy in my bathroom. Now Be A Short Intermission: 37 seconds of mindless violence!! Ten Nine Eight: the only song I ever wrote on bass guitar, and also the only one whose lyrics I substantially rewrote... the original first line would have been "Do crusaders smell of peach, mama?" With hindsight, this obliquely Borges-inspired setting seems to make much more sense! Incidentally, the intro is the sound of my bass Monty (short for Montresor, should you wonder) being "bowed" with a bottleneck by my rather inventive guitarist mate Jan.
Fivewater: to this day I have no idea why it's called that. While recording in Bristol, it turned out to be handy abbrevation for "Britvic 5/5" which was what I drank during recording breaks, but the title is older than the apple fizzy... and the "holy town" is the uncannily Catholic city of Leuven in Belgium. The Geologists Are Happy: they're female. Not that you can tell really... the amazingly realistic singing-down-the-phone effect was achieved by singing down a phone (well, into my own ansaphone), and the saxy noise at the end is the door of the new chemistry building at Mainz uni, which still hasn't been oiled since the recording of this album!! I is One: that title bugged me for weeks before I could make sense of it. I mean, it just sounds grammatically incorrect, doesn't it? The twin interpretations of "I is one way of saying we don't know" and "i =1" popped into my mind simultaneously while staring at a white door in Hechtsheim Hall of Residence. Incidentally, the i stands for the running indices mathematicians tend to give to all things they can't be bothered to count (e.g. because ther's an infinite number of the buggers) and not the imaginary number i, which of course isn't ever 1. Lyrically, this is one of the Hammill songs that took a wrong turn somewhere in song heaven and ended up being written by me... and I love it still! Price �, or � if bought by credit card - P&P inclusive. Cheques in pounds sterling only, and must be either drawn on a UK bank and payable to A New Day Records, or Eurocheques payable to D Rees. Ivyation - the title track. Voices, voices, voices. Can you tell this started out as improvisation?